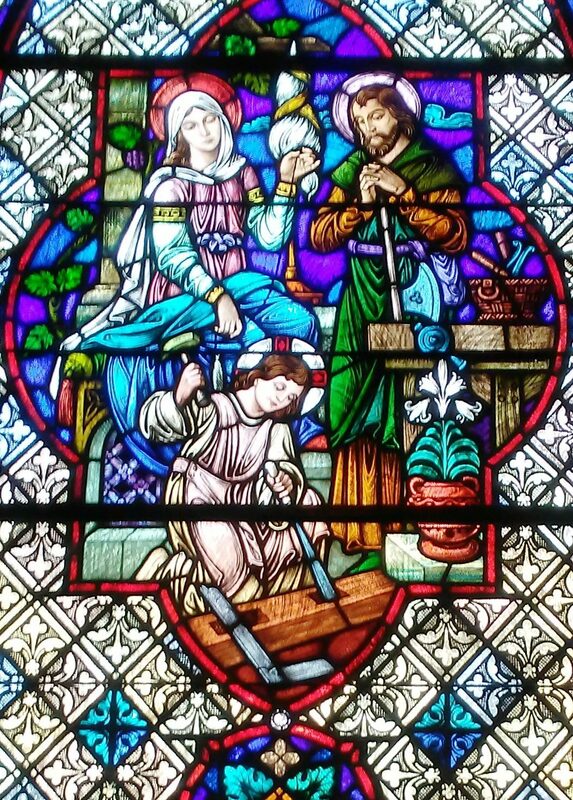 I was recently idling in the Sacred Heart Church in Raleigh when I happened upon one of the stained glass windows depicting the early life of Christ. At first sight it appears to be an idyllic happy family get together. Mary watchfully spinning, Joseph standing guard over the infant Jesus and the infant Jesus himself with a hammer and chisel in his hand working his will on a piece of wood. But where is the Judean Department of Occupational & Safety, where is the Nazareth Child Protection Agency? The child is not wearing safety goggles nor is he wearing protective gloves. It’s all very well saying that the child has his own protective guardian angels, and perhaps they will stop the chisels going blunt or other damage occurring to the craftsman’s tools. And why is Joseph holding an axe and looking vaguely lost? Overall, it’s a picture which asks more questions than it answers. And perhaps the real message is that unless you have the angels on your side, whatever you are doing, you had better wear appropriate (protective) clothing.